He was an educated man who would have been only too glad to give information about the customs, history and organization of India if Phileas Fogg had been the kind of man to ask for it. But he asked no questions. He was not travelling – he was just going round the world. He was a heavy body describing an orbit round the earth in accordance with the laws of rational mechanics. At that moment he was going over again in his mind the hours he had spent since leaving London and he would have rubbed his hands if it had been in his nature to make an unnecessary movement of that kind. Oh what a fine joke, I thought to myself. A book about travelling the world in eighty days, reviewed on a website dedicated to staying on this side of the world. For if my appeal to stay in Australia was to be rejected I could be bounced right back to Ireland in less than twenty-four hours (I’m saying this would be hypothetically possible – not likely). 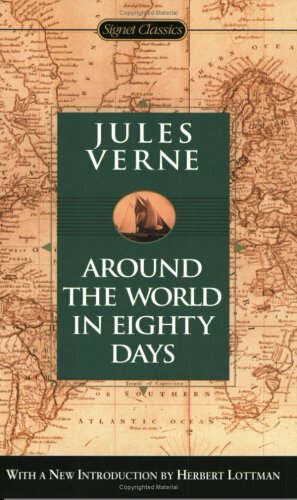 Also Round the World in Eighty Days is yet another one of those classic tales which we may all be familiar with, but have not actually read. Personally my knowledge of it mostly stems from that 80’s cartoon series Around the World with Willy Fog (ah just listening to that theme song brings so many memories back – they don’t make ‘em like that anymore). Phileas Fogg is described by his creator Jules Verne as carrying a Byronic aspect in his appearance, seeming the quintessential English gentleman, possessing great wealth and impeccable manners. However, in many ways he is also an automaton, a creature of fastidious habits who fires his manservant for providing shaving water two degrees Fahrenheit too cool and attends meetings of the London Reform Club solely for the purpose of playing whist. It is after the firing of his manservant that Fogg employs the Frenchman Passepartout, a former acrobat in search of the quiet life. Afterwards he attends the Reform Club and accepts the fateful wager that he will travel around the world in eighty days. His confidence in the prospect of his success is due to his own reckoning of the reliability of modern forms of transportation. The announcement of Fogg’s plans sends London into an uproar. With twenty thousand pounds at stack – and the gentleman’s stock literally declining due to concerns about weather delays, faulty track-work and other obstacles – he is declared a madman by most, his confirmed eccentricity now viewed as the product of a deluded mind. Meanwhile an extraordinary bank robbery of fifty five thousand pounds has left the capital bewildered. The thief in question posed as a gentleman and relying upon the honour bound principles of the Bank of England staff, made off with the incredible sum without attracting any notice. A private investigator named Fix decides that Fogg must be the culprit, with his infamous wager merely a cover for his escape to parts unknown. He decides to follow the man and Passepartout on their journey, in the hope of arresting them in British territory. As the time required by the wager passes, Fogg and a growing party of companions face any number of dangers, including death cultists, the machinations of Inspector Fix, storms, mobs and even Sioux Indians! Through it all Phileas Fogg remains imperturbable, travelling in accordance with methodical time-keeping and trusting to his not inconsiderable wealth to solve most problems. Passepartout proves to be a devoted and cunning servant, although too gullible not to identify the intentions of Fix, who soon insinuates himself into his company. Fogg undertakes the wager not to win any great glory for himself, or even for the financial reward, but out of a profound trust in the orderliness of things. Verne writes his travelogue fable with great verve and ironical wit. That Fogg and his companions see so little of the world while travelling through says as much about the nature of ‘civilized travel’ as it does today. What little local colour does make it into the narrative, Verne employs to good effect. No doubt the memorable rescue of the lady Aouda had some influence on similar adventures such as Indiana Jones and the Temple of Doom. Then there is the American electoral debate that descends into a boxing match in San Francisco, or Passpartout’s lecture on Mormonism. Great fun, I enjoyed this book immensely.